As a part of their learning experience with Science4Us, students are given access to their own “digital lab”. With their own portal into learning and their own set of tools to assist them, students feel empowered to …CLICK! 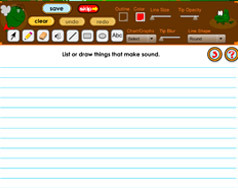 Check out a few featured tools below. The Notebook is just one of the students’ tools, but it is a powerful tool. Designed to enable pre-readers (and pre-writers) to express their understanding of any given concept with drawings and graphs, the Notebook is also a great parent-conferencing and progress-tracking tool for teachers. 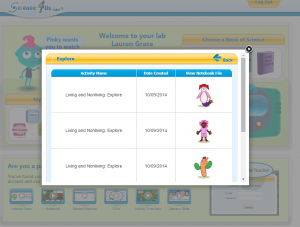 view activities and see teacher feedback. Allowing the students to track their own progress is easy when they have access to their own reports! Not only can teachers track their entire class, students are able to track their progress, as well as share it with their parents at home. 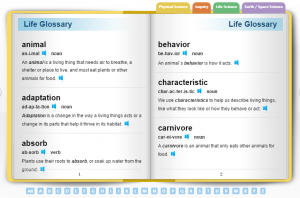 Science4Us doesn’t spare any syllables when speaking to the students, so to help them keep up, we’ve provided them with a digital glossary of their own science terms to e-flip through. As always, audio is provided for pre-readers.